​In the wake of the funerals for the three slain police officers in Baton Rouge, LA, a disturbing Facebook page has been exposed. The page, Americans For Blane Salamoni, has enraged a number of social media users as it promotes a rhetoric of hate along with racist propaganda in an effort to justify the controversial shooting of Alton Sterling. In addition to bashing statements about the deceased victim, the page has developed a reputation for verbal attacks on Black Americans, depicting them as animals and thugs. However, that’s not all. A number of questionable comments raise speculation about whether or not the page is run by Blane’s parents. On July 11, the page administrator wrote, “I’m getting mighty tired of people saying they want to harm my son. Please will you savages try and act civilized? FOR ONCE?” As expected, the controversial statement has drawn criticism from Facebook users who believe Blane should be held accountable for his actions. In fact, one person actually argued how Blane’s actions contributed to the untimely deaths of his fellow officers. The page editor responded by insisting Alton Sterling “was not murdered” and “fell victim to his own behavior.” Although many social media users have found the comments quite infuriating, the bigger issue centers around whether Blane Salamoni’s parents are running the Facebook page or not. 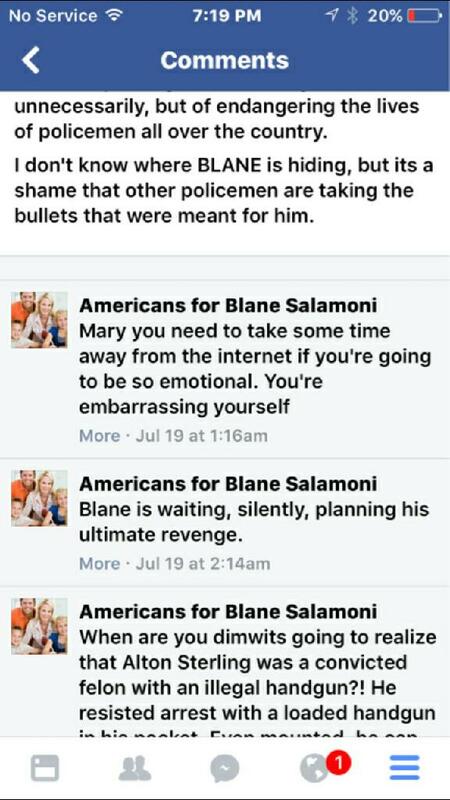 Could someone be posting hateful under the guise of Blane Salamoni’s parents, who have both served as police officers for the Baton Rouge Police Department for more than 30 years? At this point, the identify of the page administrator remains unknown. But if they are responsible for the page, there would be a serious conflict of interest since Blane’s father, Cpt. Noel Salamoni, is still an active member of the police force. As expected, the unfortunate deaths of Baton Rouge law enforcement officers Montrell Jackson, Brad Garafola, and Matthew Gerald has taken precedence over the investigation into Alton Sterling’s death but there are still numerous factors to consider as the outcome of the case could have lasting effects on the community. Could more officers be harmed for the seemingly careless actions of one? Unfortunately, these are questions that should be considered. The investigation will be ongoing. However, the surveillance footage from Triple S Food Mart has yet to be released despite all of the graphic photos and footage that were shared almost immediately after the deaths of the police officers at the hands of Gavin Long. No further details have been released about the case. Blane Salamoni and Howie Lake II remain on administrative leave with pay.